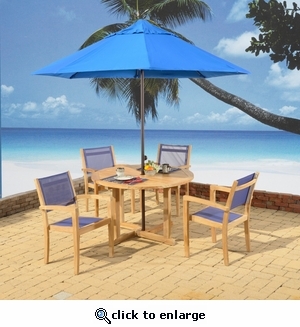 This round dining set is handcrafted of solid teakwood and is exceptionally sturdy. The 48" diameter table has an umbrella hole. The stairs come with a beautiful blue mesh that is both comfortable & easy to clean. Handcrafted using high quality plantation grown teakwood.